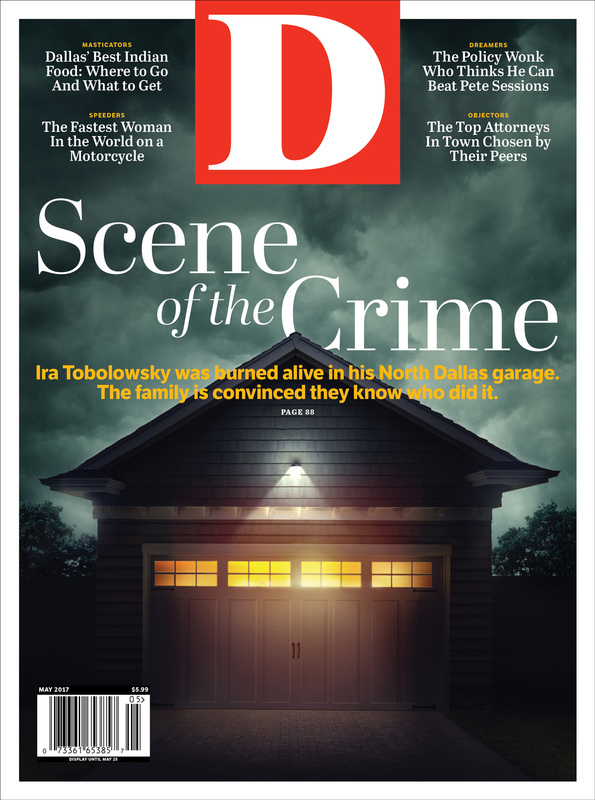 By Jamie Thompson | 2 years ago Ira Tobolowsky, a prominent lawyer, was burned alive in his North Dallas garage. A strong suspect quickly emerged. So why can’t the cops solve the case? By Eve Hill-Agnus | 2 years ago There is much more in our backyard than tikka masala. By Joe DePaolo | 2 years ago He knows Dallas is ready to embrace a local champion. On May 27, on Showtime, he’ll get his chance to give them one. By Caitlin Clark | 2 years ago Pins and patches are back. By Peter Simek | 2 years ago Longtime SMU professor Willard Spiegelman offers art and architecture criticism from a distance in this collection. By Eve Hill-Agnus | 2 years ago The Deep Ellum restaurant is still working out kinks, but the sprawling menu is worth a visit. By Michael J. Mooney | 2 years ago We asked some of the finest family law attorneys to dish on their most memorable divorce cases. By Tim Rogers | 2 years ago Leslie Porterfield talks motorcycle racing, tattoos, and motherhood. By Catherine Downes | 2 years ago Eggstravagant taste. By Peter Simek | 2 years ago How a five-year project brought two organizations together. By Eric Celeste | 2 years ago Who the heck is he, and why does this Dem think he can beat the longtime incumbent? Meet District 32's Don Quixote. By Catherine Downes | 2 years ago The West Coast chain comes to Carrollton.